NIDR study shows no relationship between fluoridation and tooth decay rate. Data collected by the National Institute of Dental Research (NIDR) of the United States Public Health Service (USPHS) produced the largest and most extensive database ever used to determine whether there is a relationship between fluoridation and tooth decay. Released on June 21, 1988, the $3,670,000 nationwide survey examined 39,207 U.S. school children aged 5-17 from 84 different geographical areas. Of the 84 areas, 28 had been fluoridated for 17 years or more, 29 had never been fluoridated, and 27 had been only partially fluoridated or fluoridated for less than 17 years. Age-adjusted tooth decay rates for the permanent teeth of children were determined for each of the 84 areas which were then listed in the order of increasing tooth decay rates. 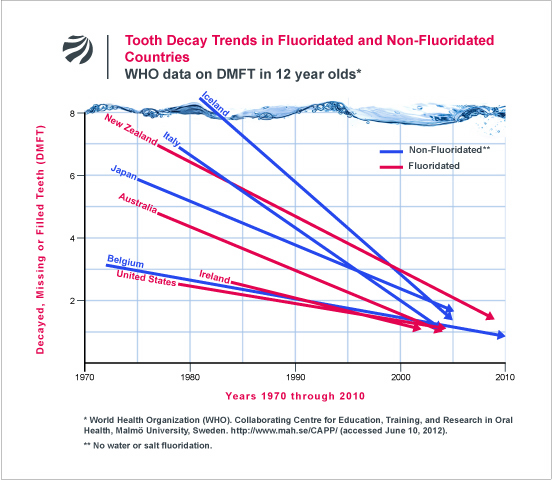 The listing showed clearly that there was no relation between tooth decay rates and fluoridation. Ironically, the lowest tooth decay rate reported in the survey occurred in a nonfluoridated area. The average number of decayed, missing, and filled permanent teeth (DMFT) per child was 2.0 in the fluoridated areas, 2.0 in the nonfluoridated areas, and 2.2 in the partially fluoridated areas. The percentage of decay-free children in the fluoridated, nonfluoridated, and partially fluoridated areas was 34%, 35%, and 31%, respectively. Also making this venture less of a gamble were papers from Canada (Gray, A.S., J. Canadian Dent. Assoc. 53, 753-755 ), and New Zealand (Colquhoun, J., Community Dent. Oral Epidemiol. 13, 37-41 ), which showed that tooth decay in fluoridated areas was the same or slightly higher than in nonfluoridated areas. Both authors were public health officials who had previously been very active in promoting fluoridation. Based on his extensive research, Dr. Colquhoun concluded that fluoridation did not reduce tooth decay. His continuing research has documented many flaws and distortions in earlier studies claiming that fluoridation reduces tooth decay and has led him to take an active role against fluoridation. Dr. Gray’s reaction was indeed curious. 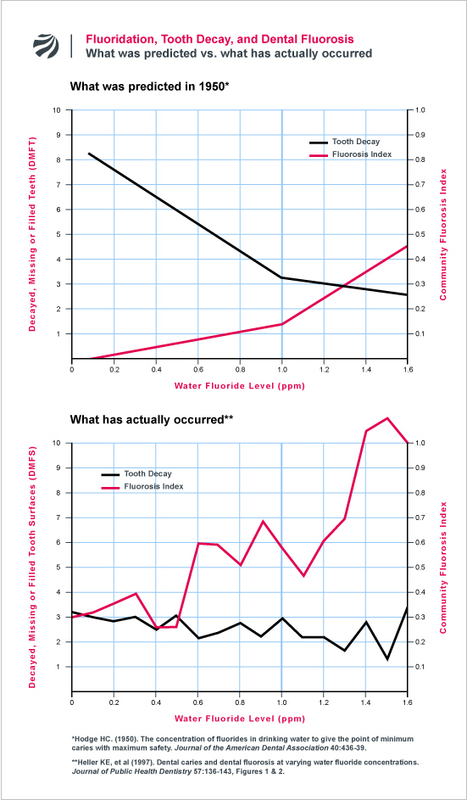 In his paper, he stated, “Survey results in British Columbia with only 11% of the population using fluoridated water show lower DMFT [tooth decay] rates than provinces with 40-70% of the population drinking fluoridated water” and “school districts recently reporting the highest caries-free rates in the province were totally unfluoridated.” From this he made the absurd conclusion that fluoridation is probably only reducing tooth decay by 25%! To further confound its audience, the NIDR release stated, “Half the children in the United States have no tooth decay.” We found this statement to be false and misleading. Among 17-year-olds, for example, only 14% were decay-free; even among 7-year-olds, a majority had tooth decay. In comparing the results of this survey to another survey completed in 1980, the release claimed that tooth decay rates had declined. It failed to mention that the use of different areas in the 1980 survey precluded them from making a valid comparison. Whether it is dishonesty, or incompetence, or both, that impels the NIDR to continually make false statements in a zealous promotion of fluoridation, it is certainly time we stop funding these corruptive activities and start an investigation of the Institute for fraud. If this is not done, the NIDR and the other branches of the USPHS will continue to undermine the scientific integrity of dental research.